Space junk experts have confirmed when and where the wayward Russian Mars probe Phobos-Grunt re-entered the atmosphere and crashed back to Earth. When an ill-fated Russian Mars probe fell to Earth over the weekend, the spacecraft's untimely demise set off a flurry of conflicting media reports and conspiracy theories. Russian space industry officials say the United States may have accidentally destroyed Russia's most expensive and ambitious space mission since the Soviet era. But the accusation doesn't hold up to scrutiny. Russian space officials are investigating whether interference from an American radar station may have led to the demise of a failed Mars probe that fell back to Earth on Sunday (Jan. 17), according to media reports. Where On Earth Did Russia's Dead Mars Probe Crash? Despite reports that a failed Russian Mars probe fell to Earth Sunday (Jan. 15) and plunged into the Pacific Ocean, some confusion remains over where exactly the spacecraft crashed, according to Russian news reports. After languishing in Earth orbit for more than two months, the 14.5-ton Phobos-Grunt spacecraft fell at around 12:45 p.m. EST (1745 GMT) Sunday, apparently slamming into the atmosphere over an empty stretch of the Pacific, Russian officials told the Ria Novosti news agency. A botched Russian Mars probe is just hours away from a fiery doom when it plunges into Earth's atmosphere in a fatal crash. It won't fall over the United States, but may crash into the Atlantic Ocean, Russian space officials said today (Jan. 15). Russia's botched Mars probe mission Phobos-Grunt is fast-approaching a fiery death, with just one or two days remaining before it falls from space, experts and Russian space officials say. Where Will Doomed Russian Mars Probe Fall? Nobody knows for sure when, or where, Phobos-Grunt will come crashing down. 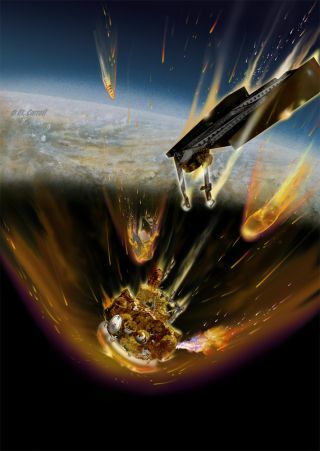 A piece of debris from a 2009 satellite crash forced the maneuver. Phobos-Grunt is slated to re-enter Earth's atmosphere between Jan. 14 and Jan. 16. The growing threat of space junk is now starring in a 3D film. Regular people have started paying attention to orbital debris. Unnamed forces may have brought down Phobos-Grunt and other missions, hinted the head of Russia's space agency. A French skywatcher has recorded what is likely one of the last videos of the falling Phobos-Grunt space probe. The Phobos-Grunt spacecraft should re-enter our planet's atmosphere Jan. 15, officials say. The marooned Mars spacecraft is expected to fall to Earth in mid-January. Up to 30 pieces of the 14-ton Phobos-Grunt Mars probe could reach the ground. Experts are predicting that Phobos-Grunt could fall to Earth in early January. The Phobos-Grunt spacecraft has been stranded in the wrong orbit since Nov. 8. A member of the Phobos-Grunt science team apologized for the collapse of the mission. Pieces of Phobos-Grunt have reported already fallen to Earth. Efforts to contact the Russian Phobos-Grunt spacecraft have failed. Medvedev said the recent failures have harmed the country's competitiveness. Astrophotographer Ralf Vandebergh took this image of Russia's Phobos-Grunt probe on Dec. 28, 2011, as the troubled spacecraft flew over Europe. Ralf Vandebergh spotted the Phobos-Grunt spacecraft with a 10-inch telescope. See an early video of the Phobos-Grunt Mars probe captured by an amped up security camera. The troubled Phobos-Grunt spacecraft remains in a low-altitude orbit above Earth. Time is running out to save the Russian Phobos-Grunt spacecraft. Satellite builders are considering measurements to reduce risk if spacecraft fall back to Earth. A tracking station in Australia succeeded in contacting the Russian Phobos-Grunt probe. An international effort is under way to save Russia’s Phobos-Grunt mission to Mars. Why Is It So Hard to Go to Mars? It's not easy reaching Mars. Not at all. Nearly a week in, engineers still haven't given up hope on Phobos-Grunt. Russia's ailing Phobos-Grunt Mars moon probe remains silent to Russian engineers' calls. A mission scientist shares what it's like to have a spacecraft on the edge. If Russian engineers cannot save the Phobos-Grunt spacecraft, it will become another piece of space junk. The probe failed to leave Earth orbit on its way to Mars. Here's a look at all the Mars missions to date, with those that failed in bold. Russian space officials say the Phobos-Grunt spacecraft did not fire its engines as planned. The Phobos-Grunt mission aims to return samples of Phobos to Earth by 2014. Russia is set to launch a robotic spacecraft to the Mars moon Phobos today, marking the nation's first attempt at an interplanetary mission in 15 years.